Considering the suggestion of the Indian Olympic Association to reduce the life ban slapped on three women lifters and the chief coach after the Athens doping fiasco last year, the Indian Weightlifting Federation has agreed to reverse its decision. Moody asserts he can handle Sachin and co.
One of the shortlisted candidates for the Team India coach's job, Australian Tom Moody insists handling superstars like Sachin Tendulkar and Sourav Ganguly won't be a problem for him if he takes over. Harbhajan Singh, whose bowling action came under the scanner for the second time in the last four months, has deferred his plan to play county cricket in England during this season till the clearance of his action by the authorities concerned. International Cricket Council President Ehsan Mani performed the ground-breaking ceremony for the governing body's base at the Dubai Sports City here today. Pakistan vice-captain Younis Khan hopes that the first Test on the Caribbean tour would not only be a further boost to his career on the ascendancy but also set up the team's first series win in 48 years. Indian football captain Baichung Bhutia, who was released from the hospital this afternoon, said he was feeling much better and hoped to come back stronger next season. 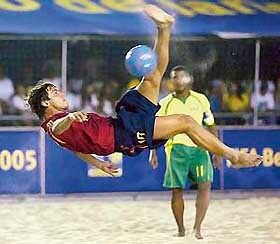 Ramiro Amarelle of Spain performs a scissors-kick as Romario Faria of Brazil looks on during their FIFA Beach Soccer World Cup match in Rio de Janeiro on Tuesday. Brazil won 4-1. 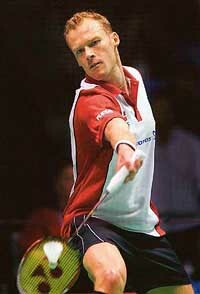 Tim Henman of Great Britain serves to compatriot Greg Rusedski during their match at the Hamburg Masters on Wednesday. 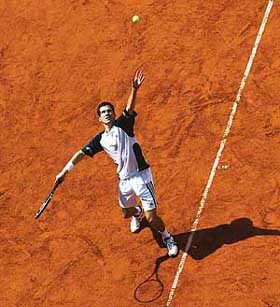 Henman won 7-6, 6-4.
first-ever tour of the country to play a three-match series which kicks off on June 11 at Quetta. A second-half strike by substitute Hassan Maatouk helped Lebanese club Al-Ahed edge past Dempo Sports Club by a solitary goal in a Group B match of the AFC Cup here today. Top seed Maria Sharapova reached the last 16 of the Rome Masters, but her Russian compatriot Svetlana Kuznetsova failed to join her in round three. India’s Karan Rastogi fashioned an impressive 7-6 (7-4), 6-2 win over Yu Wang Jr of China to storm into the quarterfinals of the Uzbekistan Futures Tennis Tournament today. Despite Gurtej’s knock of 102 runs, Minor Districts Zone A were struggling against hosts Ludhiana at draw of stumps on the first day of the Inter-District Cricket Tournament (u-17) for the M.L. Markan Trophy, here today. A fine century by Amitoj Singh and a supporting knock of 89 by Jeewanjot Singh enabled Patiala to score 259 all out against Chandigarh in a league match of the M.L Markan Trophy (u-17) which commenced at Dhruv Pandove Stadium, here, today. Wrestling Federation of India has selected eight women grapplers to represent India in Asian Junior Women Wrestling Championship to be held at JEJO Island in Korea from June 8 to 12. The Himachal Pradesh Cricket Association has termed the state Sports Act as a black law which will undermine the autonomy of the sports bodies and enable the government to interfere in their day-to-day functioning. Considering the suggestion of the Indian Olympic Association (IOA) to reduce the life ban slapped on three women lifters and the chief coach after the Athens doping fiasco last year, the Indian Weightlifting Federation (IWF) has agreed to reverse its decision. “We have recently received a letter from the IOA, suggesting reducing the ban on three women lifters and chief coach, and decided to reduce their suspension period to two years as per WADA laws,” IWF Secretary General Balbir Singh Bhatia said. The federation had conveyed the news to the lifters through the Police Force Control Board, he said, but added that an executive committee meeting would further deliberate on the fate of Pratima Kumari and Sanamacha Chanu, who tested positive for banned drugs for the second time at Athens. According to the rules, the weightlifters could be banned for life if caught twice for doping offence, he said. “We have sent letters to them conveying the news. But we will place the matter of Pratima and Sanamacha before our executive committee when it meets,” Bhatia said. Sunaina’s suspension period would be over in April 2006. Sanamacha, currently out of station, said she would meet federation officials after returning and only then could she give a statement over the issue. While Pal Singh Sandhu, who was the chief coach, said he had been informed by the IWF about it over telephone and he would be used by the federation in technical capacity, but not for coaching purposes. “I will not be able to take up any coaching assignments for two years, but will be used for technical purposes like referring and umpiring,” he said. “None of the girls have said that I advised them to take banned drugs, so I will use that to appeal and vindicate my point,” he added. Meanwhile, Pratima, who had appealed to the International Weightlifting Federation against the ban and filed a case holding coaches responsible for the Athens episode, said she was yet to receive any communication from the IWF. Claiming that the reduction in the weightlifters’ punishment was due to her persistent fight, Pratima slammed the IWF for not having enough courage to openly announce its decision. “If they called a press conference to announce the life bans on us, they should announce the reprieve also before the press. Why are they quietly sending us the letters,” Pratima said. “It was my persistant struggle for justice because of which today they had to reconsider their decision. I am happy that it did some good to other lifters also,” she said. When told that the decision could again be changed as the IWF was planning to place her and Chanu’s case before it’s executive committee since they were caught for the second time for the doping offence, the dope-tainted lifter said it was untrue. “I have never been caught for doping earlier. In 1996, which was my first competition, they tested me for banned drugs, but I returned a negative test,” she claimed. ''Not just Sachin, I have played against some other Indian cricketers from this current team as well. I'll be at home with all of them, that's for sure,'' Moody said. Harbhajan Singh criticised the International Cricket Council (ICC) for the confusion over the legality of his bowling action due to delay in resolving the issue while claiming that the episode had destroyed his mental peace. The off-spinner was reported for a suspect bowling action for his ‘doosra’, a delivery that spins away from a right-handed batsman, after the second Test between India and Pakistan at Kolkata. Harbhajan revealed that he was planning to play county cricket, but confusion over his bowling action had virtually destroyed his mental peace. “I have deferred my plans to play county cricket till the clearance of row over my bowling action. In fact, I feel being victimised for no fault of mine. The ICC should have acted swiftly to clear the row. Instead, the apex body has miserably failed to redress the issue. Instead of concentrating on the game to further improve my performance, I am just passing time to wait for clearance from the ICC,” lamented Harbhajan. Harbhajan was reported in December on the tour of Bangladesh and again in March during the series against Pakistan. The spinner termed as “unjustified” the provision in the rules for the umpires or referees to call or report a bowler although he was cleared before. “The Indian cricket board had already written to the ICC and raised its objections on my undergoing one more test to clear the bowling action. A similar test had already been conducted on me in Australia in this regard and what is need of such a test again?” questioned Bhajji, who add such controversies had badly affected his performance. International Cricket Council (ICC) President Ehsan Mani performed the ground-breaking ceremony for the governing body's base at the Dubai Sports City here today. The ICC headquarters will initially be based in the Dubai Media City until the completion of the Dubai Sports City. The financial wing of the ICC will also be shifted here from Monaco by August this year. After the ceremony, Mr Mani said the unification of the ICC's wings would enable the organisation to serve its members better. The ICC also unveiled plans of a cricket academy which will be ready by 2007. There will be indoor and outdoor training facilities, lecture theatres, classrooms, sports science and sports medicine facilities to serve the cricketers, coaches, umpires, curators and administrators. Younis will don the mantle of captaincy for the first time when he leads the team at Barbados as skipper Inzamam-ul Haq serves out the one match ban for dissent against umpiring decisions on the recent series in India. "I believe that Barbados Test will have a huge impact on my career and if I manage to win it, it would not only provide me an ideal start but it will also lay the foundation of our first series win in nearly five decades," Younis told PTI shortly before the team's departure on a four-week tour for three one-day internationals and two Tests in the Caribbean. The Pathan is embarking on the tour with a huge reputation after a successful tour of India. Some even have tipped him as future captain. However, Younis is trying to handle things as coolly as possible. "To tell you the truth, I am not at all over-excited or over-enthusiastic or its not that butterflies are flying in my belly with the prospects of leading Pakistan at Barbados," Younis, who was Pakistan batting's mainstay in India with scores of 9,1, 147, 0, 267 and 84 not out, said. "But yes, I am happy because this (captaincy) is a proof that you really have something extra in your personality and cricketing abilities", he said. "You may not believe it but I have captained Peshawar and Habib Bank in domestic matches and I felt tremendous pressure from all quarters. So in that context, I don't think there will be huge pressure on me," Younis said. He said the series would lose its attraction and interest if seven cricketers, including Brian Lara and Ramnaresh Sarwan, did not play because of dispute between rival sponsors. Bhutia, who was admitted to the hospital two days ago, has been detected with hyper-thyroid and minor liver dysfunction. He said he was feeling much better after medication started and was confident that he would be back soon. Baichung Bhutia said he would start jogging after three weeks and early next season he would be ready for competitive soccer. “I needed a break from hectic soccer. If anything, it will do be good,” Bhutia said, who would leave for Sikkim by the end of this month. A 28-member Indian football team will arrive in Pakistan on June 10 for their first-ever tour of the country to play a three-match series which kicks off on June 11 at Quetta. Meanwhile, the Pakistan Football Federation (PFF) has announced a two-day trial camp from May 15 at Quetta for the 31 probables who would train under the supervision of coaches Tariq Lutfi and Akhtar Mohayouddin. Peshawar will host the second match on June 13 which will be played under lights and the third match is slated for June 17 here at the Punjab Stadium. Talking to reporters, Director Technical PFF Lt-Col Mujahid Ullah Khan admitted it would be quite hot in June. ‘’We suggested dates in February last but the Indian federation (AIFF) proposed the dates in June,” he said. “So keeping in mind the hot weather, we have arranged matches under lights. The weather at Quetta will be manageable plus in evening the match will also pull crowd in handsome number,’’ he said. He also refuted reports that India would send their under-21 team and confirmed the visitors would come with their national team. Al-Ahed, who had territorial advantage throughout the match, scored the all-important goal in the 72nd minute when Maatouk got the better of defender Raju Singh inside the box and beat goalkeeper Abhijit Mondal from an acute angle. Al-Ahed utilised the flanks well with long passes and could have easily won the return match by a bigger margin had they not missed at least three clear chances. Dempo, who defended well, also had their chances to score, but goalkeeper Biilal Hachem made two good diving saves. six points from three matches and brightened their chances of qualifying for the next round. Sharapova, who as one of the top eight seeds was given a first round bye, beat Spaniard Anabel Medina Garrigues 6-4, 6-2, while fifth seed Kuznetsova was defeated 6-2, 6-4 by Argentinean doubles specialist Paola Suarez. Reigning Wimbledon champion Sharapova, who hit 32 winners, but made 26 unforced errors, admitted that there was plenty of room for improvement after a patchy second round performance riddled with mistakes. “The first match was never going to be easy and I had to be really patient, but it was good to get it over with,” said the Siberia-born 18-year-old, who would become world number one for the first time if she wins the title here. Suarez, number 28 in the singles rankings and one of the world’s best doubles players, was delighted with her second round victory over Kuznetsova after first round exits in her last four tournaments. Seeded trio Tatiana Golovin, Elena Likhovtseva and Daniela Hantuchova all suffered humiliating first round exits at the Foro Italico. Serbian Ana Ivanovic defeated French 12th seed Golovin 6-3, 6-4, while Israel’s Anna Smashnova beat Russian 11th seed Likhovtseva 6-1, 6-3 and Slovakian 16th seed Hantuchova lost 6-1, 6-2 to Croatian Sanda Mamic. According to information received here, Rastogi, who had earned a wild card in the main draw, enjoyed a consistent game in his second round encounter and after winning the opening set in the tie-breaker, dominated the second set. In reply to Minor Districts Zone A’s first innings total of 196 all out, Ludhiana were cruising at 72 runs for one wicket after 27 overs. Brief scores: Minor Districts Zone A (Ist innings): 192 all out in 67.3 overs (Gurtej 102, Gagandeep Dhand 4 for 40, Nakul Sharma 3 for 53); Ludhiana (Ist innings): 72 for 1 in 27 overs. At one stage, the hosts were cruising comfortably at 158 for 1 before Sandeep Bhatacharya and Pankaj put the skids under the hosts to bowl them out for 259. Wrestling Federation of India (WFI) has selected eight women grapplers to represent India in Asian Junior Women Wrestling Championship to be held at JEJO Island in Korea from June 8 to 12. The team: 44 KG: Sudesh Kumari (Nidani), 48 KG: Guddi Panwar (UP), 51 KG: Geeta (Har), 55 KG: Rachna Shekhawat (Har), 59 KG: Poonam Bamal (Har), 63 KG: Geetika Jakhar (Har), 67 KG: Suman Dahiya (Har), 72 KG: Kavita (Har). Mr Sanjay Sharma, spokesperson of the association, ridiculed the statement of Mr S.C.Nayar, a former general secretary of the association, hailing the enactment of the new law and said they were making such misleading statements to hide their own failures. Obviously, Mr Nayar and others who managed the sports all these years were finding it difficult to swallow the success achieved by Mr Anurag Thakur as the president of the association in promoting cricket in the state and improving the lot of cricketers. He said Mr Nayar, during whose tenure Mr Lalit Modi was given the right to vote on behalf of the state association, had no locus standi to accuse Mr Thakur of undermining the interests of the state. Under Mr Nayar even the account of the association had not been maintained, he said. Panchkula lad Sahil Khattar was the star player for Indian roller hockey men that outplayed formidable Chinese Taipei by 15-7 in the first tie of the roller hockey match in the 12th Asian Roller Skating Tournament being held today at Jeonju (South Korea). As per fax message received here from Ms Madhu Bahl, manager of the Indian team, the scores remained 9-3 in favour of India in the first half. Sahil Khattar scored six goals followed by Manpreet Singh who also struck six goals. Parminder Singh scored three goals for India. Advocating formation of an expert committee to appoint coaches, Indian Hockey Federation (IHF) selector and former Union Minister Aslam Sher Khan today said full-time manager should be appointed to realise potential of Indian team which made tremendous comeback in last four years. "IHF members/voters are being obliged and offered foreign trips by making them team managers. This trend should stop and full-time managers should be appointed to realise team's potential," Khan told reporters here. SYDNEY: Australia’s Lleyton Hewitt is a major doubt for this month’s French Open after breaking two ribs in a fall. The world number two, still recovering from surgery on his right toe, suffered the injury in a freak accident at his Sydney home on Monday. “It is an unfortunate mishap and very disappointing,” Hewitt’s coach Roger Rasheed told Australian media on Wednesday. Hewitt’s absence at Roland Garros would be a further blow to Australia’s chances of winning on the red clay of Paris. Australia’s highest rankedfemale, Alicia Molik, has already pulled out because of injury and former Wimbledon finalist Mark Philippoussis turned down the offer a wildcard. Sofia: Ahead of the World Championships later this year, Viswanathan Anand will look forward to an improved performance in the Mtel Masters Chess tournament that begins here from Thursday. With six of the world’s elite players in the fray in the double round-robin tournament, Anand will have his task cut out in inching towards the magical figure of 2800 ELO points - a milestone that has eluded the Indian star thus far. To be played under Classical time control, the event features world number three Veselin Topalov of Bulgaria, fifth ranked Vladimir Kramnik of Russia, Britain’s best player Michael Adams, top rated woman Judit Polgar of Hungary and the youngest ever World champion Ruslan Ponomariov of Ukraine.